Have you ever experienced PSS or Post-Storytelling Syndrome? Have you been nagged by the "I should have read that bedtime story better" feeling? A big YES for me. There were times when I thought I should have changed voices when I read "Ang Pagong at ang Matsing". It would have been easier for Rio to remember the story if I created voices fit for the characters (big and greedy for Matsing while a tiny and kind voice for Pagong). I often wondered how I could describe Gruffalo (He has knobbly knees, and turned-out toes, and a poisonous wart at the end of his nose") so it won't sound fearful for Rio. I remembered one of the tips I got from a workshop of The Learning Basket. Research on the book you are reading to your child to know how to make it more interesting. 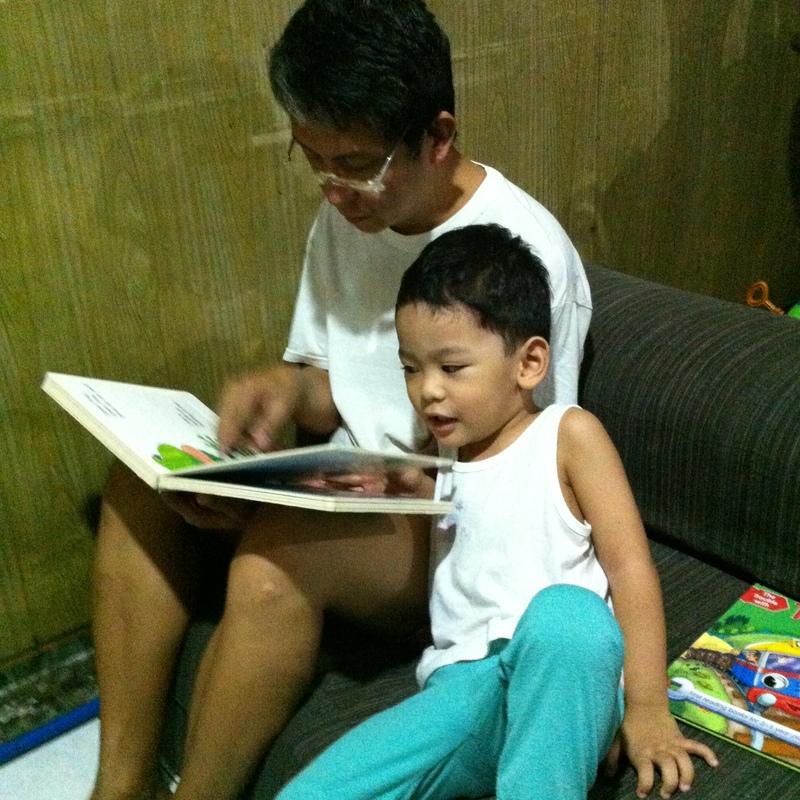 Singing Snuggle Puppy by Sandra Boynton to my dearest Rio instead of just reading made it so much fun for us. When I first saw Manila Workshops' poster about this learning event, I immediately sent a message to my dearest friends Mommies Joy and Lui. I thought this would be a perfect follow up learning experience after the preschool homeschool workshop that we attended at The Learning Basket. We do need to be good storytellers to our toddlers if we want them to enjoy and love reading during these early years. 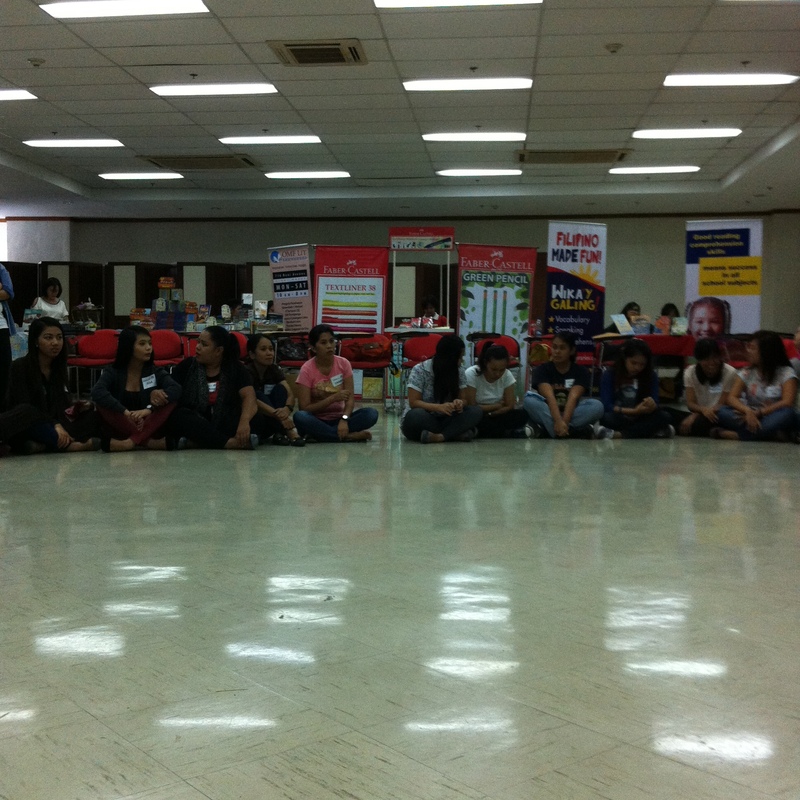 Big thanks to Manila Wokshops for encouraging me and making it possible for me to attend this workshop. This is the most fun workshop I have ever attended so far. Highly recommended for parents who treat story time/ story telling as an essential part of their family bonding. Here are my thoughts on why you should wait for that rerun announcement ( or actively request for one) of this workshop. 1) Raise readers. Tell stories. 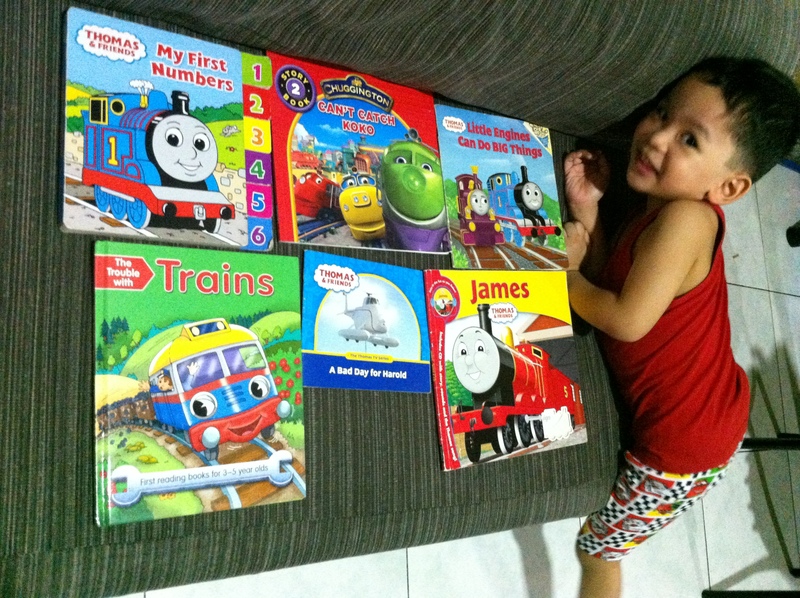 Introducing books to our toddlers should not end in choosing and collecting the right books for them. Storytelling parents are the most important element in creating long lasting bonds between our children and books. 2) Release and embrace your inner child. When was the last time you walked hand in hand with someone you've just met and exchanged spontaneous stories together? It was so much fun seeing that little child in me come out and be playful again. 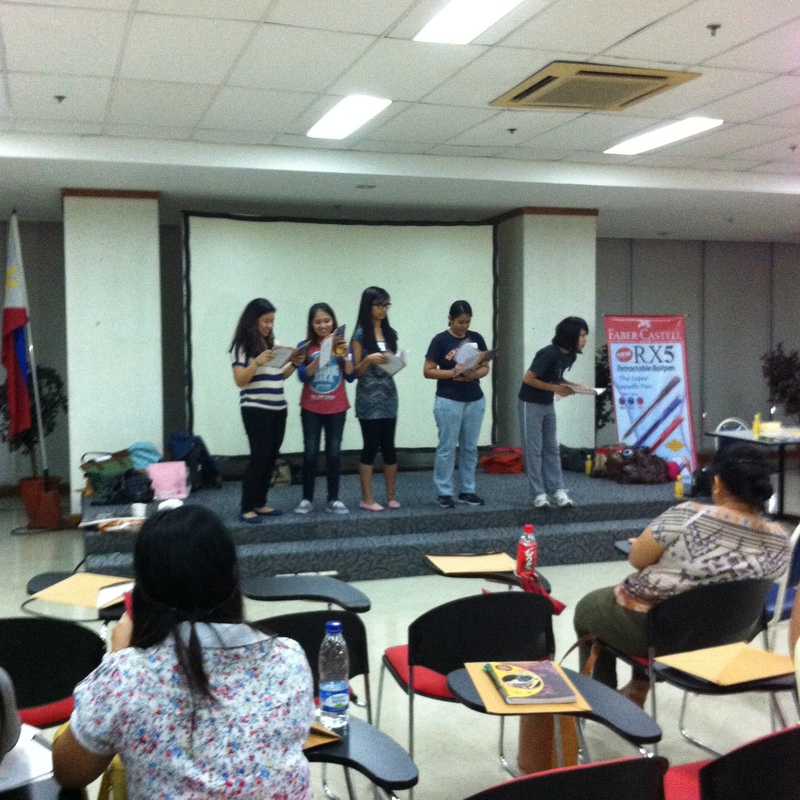 The workshop exercises definitely stimulated every part of my body especially my brain. This workshop would literally make you roll. I enjoyed dancing, sitting on the floor, singing, clapping and acting. Once you enter the workshop room, internalize that liberating part when Elsa sings Let it Go. Seriously, try your very best to forget all fears, questions and worries running around your head. Just go with the flow and you will definitely enjoy. Most of the workshop attendees were passionate teachers and mothers. We had a workshopper who has 30 years of experience as a preschool teacher and school administrator yet was excited and game as everyone. She is one true example of great passion and true love for reading and new learnings! I also met like minded mothers who are pursuing the challenging yet fulfilling task of preschool homeschool. I'm looking forward to sharing lessons and play activities with my preschool homeschool mommy buddies. 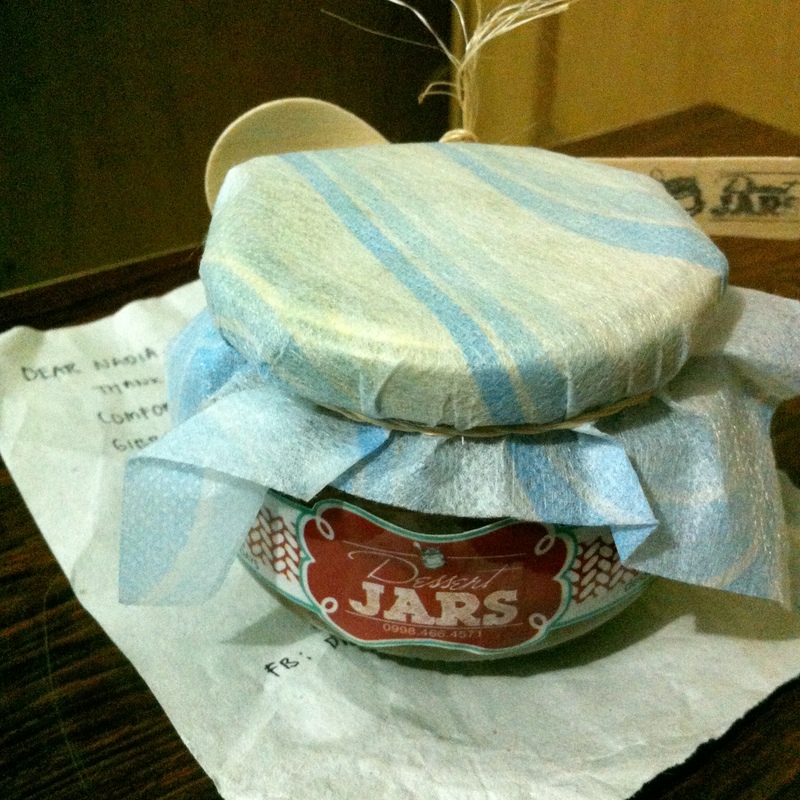 Lastly I met a sweet classmate and workshop exercise partner who surprised me with a dessert jar with a very touching thank you note. Don't miss the chance to meet and experience Kuya Bodjie's excellent storytelling and engaging workshop exercises. We were all raving about the workshop even inside the elevator! If there was a post workshop interview (just like in cinemas after watching a Pinoy film), we would all say these comments : Sulit! Best workshop ever! Kuya Bodjie, you rock! Ibalik ang Batibot! I hope to meet him again in one of the workshops or storytelling events where I can tag Rio and Tatay along. The Art of Storytelling Workshop was organized by Manila Workshops and GPG Bulilit Bookstore with The Learning Library and Insular Life as co-presentors. Nanays, what are your favorite storytelling books? Leave a short note and let's share our storytelling tips and experiences. 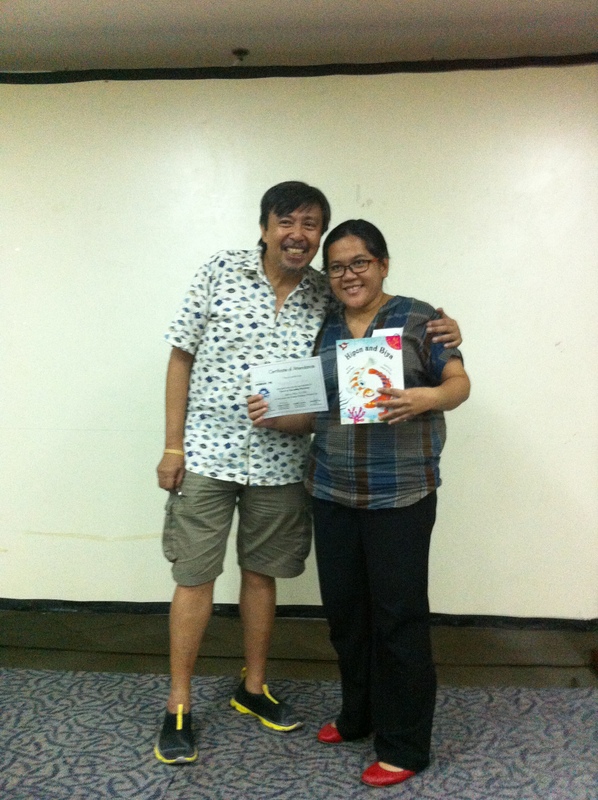 Thank you Nanay Nadia for joining us, and for sharing your take-aways from the workshop. Glad you had lots of fun and learnings. 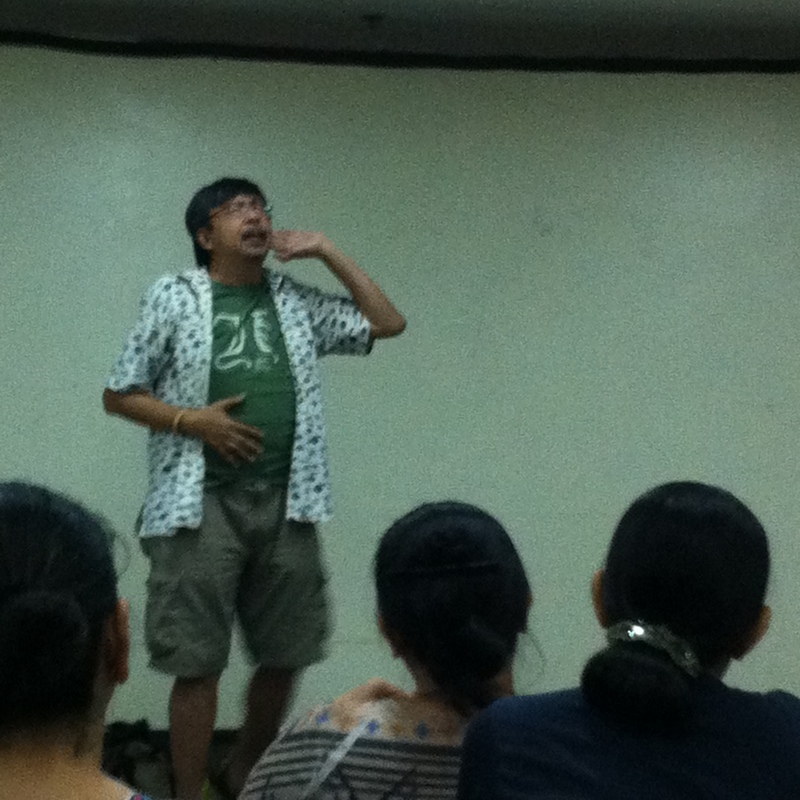 No better way to learn the art of storytelling than from the master storyteller himself, Kuya Bodjie! Parang Batibot days lang... haha... :) Nice to meet you! Kuya Bodjie's storytelling was my favorite part in Batibot growing up. such a shame that there's no more quality Filipino-language kiddie show these days! definitely want Batibot back! Thanks for sharing this, Nadia! Aww, too bad I missed this. I hope a rerun will happen soon. Miss Ging! Good luck on the 12th! Tiyakk performance level na naman si Kuya Bodjie! Am sure it will! Hoping to see more mommies on this rerun on July 12. Please help us spread the word! :-) Thanks and see you soon. Mommy Joy! How are your storytelling sessions with your daughter? Have you read Ang Barumbadong Bus to her using Teacher Dyali's tips? Happy read aloud / storytelling to you! Thanks Sally! Are you attending Kuya Bodjie's workshop this Saturday? If yes, I am very sure that you will enjoy every minute of it. Last song syndrome niyo na ba ni baby ang Snuggle Puppy song? See you soon! I dropped by your blog, Rina! You're blessed with twins and I love their names! I hope we can meet in one of our blogging/mommy gigs very soon! Mommy Kat, there will be a rerun this July 12. Join ka! 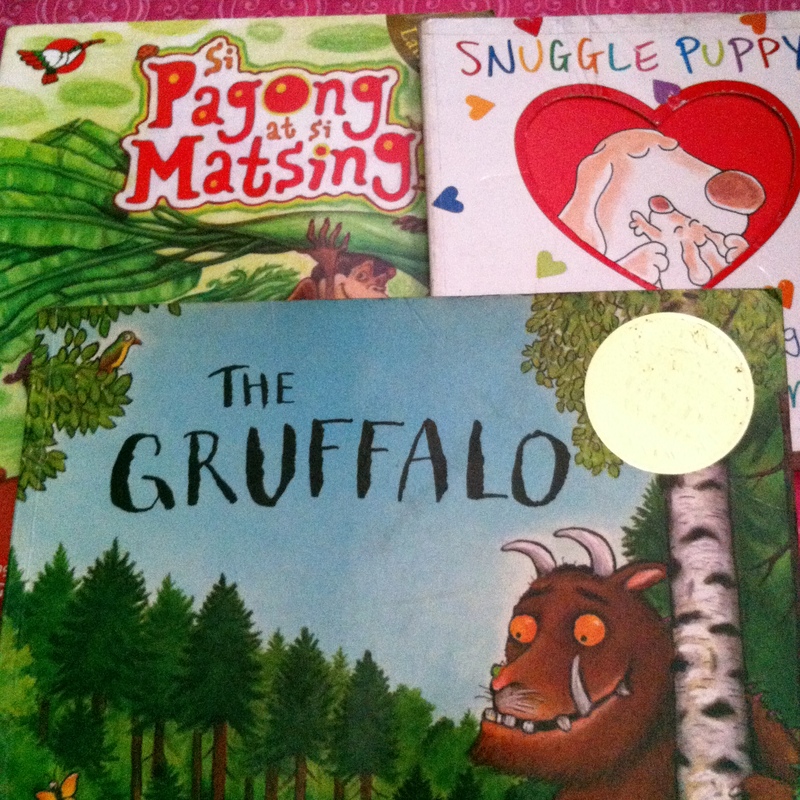 :-) What are your favorite read aloud / storytelling books? Let's share. :-) Happy reading!